The Titan cleared 5 feet today! If you have been following the daily growth, you may remember that yesterday we measured the Titan at 56.6", indicating it grew 4 inches between yesterday and today. 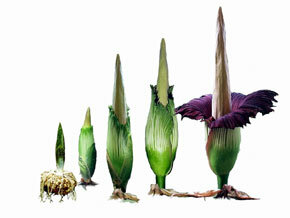 This is highly unlikely this close to bloom time. Well, we discovered that our survey stake is divided into tenths of a foot (approx. 1.2") instead of 1" increments. So, above is our updated growth chart where you will notice the Titan grew just 2 inches from yesterday. 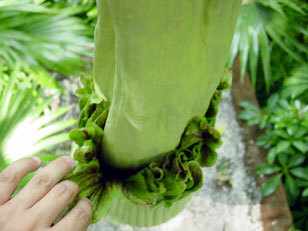 The spathe is really beginning to darken up inside (see below, left) and the last of the bud bracts have dried up and withered. We're getting close! We received the pollen this morning. 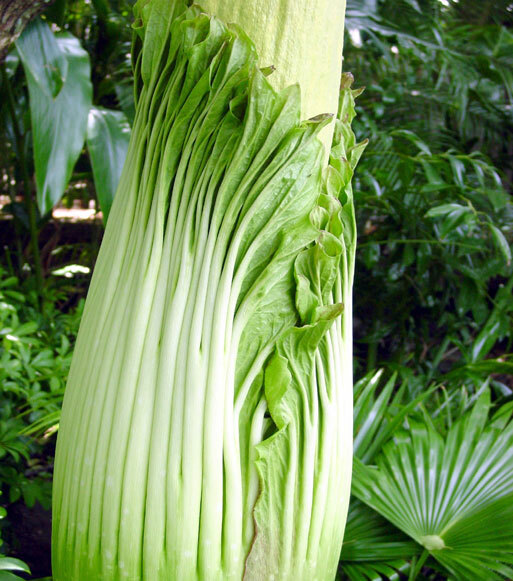 Again, much thanks to the Stephan F. Austin State University Mast Arboretum and Dr. Dave Creech for contributing some pollen from their Titan Arum, "Jack." I also received an e-mail today from the Atlanta Botanic Garden, who has a Titan approaching bloom, requesting some of our pollen. So the pollen chain continues. DID YOU KNOW: There are at least 170 species of Amorphophallus! 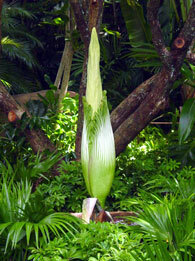 Amorphophallus titanum is the largest species. Amorphophallus gigas and A. hewitii are colossal species as well, and are also present in the Walt Disney World Amorphophallus collection. This page was created by Scott Hyndman for the I.A.S. on July 15, 2004.